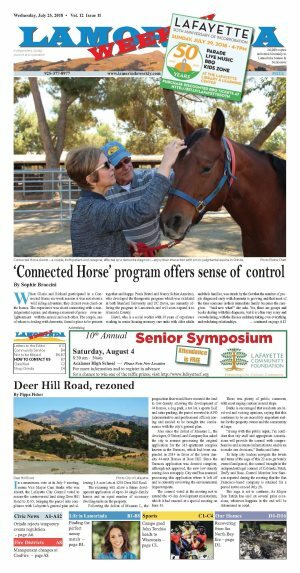 In a unanimous vote at its July 9 meeting, minus Vice Mayor Cam Burks who was absent, the Lafayette City Council voted to rezone the controversial land along Deer Hill Road to R-65, bringing the parcel into compliance with Lafayette's general plan and allowing 1.5-acre lots at 3233 Deer Hill Road. The rezoning will allow a future development application of up to 14 single-family homes and an equal number of accessory dwelling units on the property. Following the defeat of Measure L, the proposition that would have rezoned the land to low-density allowing the development of 44 homes, a dog park, a tot lot, a sports field and extra parking, the parcel reverted to APO (administrative and professional offices) zoning and needed to be brought into conformance with the city's general plan. Also since the defeat of Measure L, the developer, O'Brien Land Company has asked the city to resume processing the original application for the 315-apartment complex known as the Terraces, which had been suspended in 2014 in favor of the lower density 44-unit Homes at Deer Hill. Since the Terraces application was deemed complete, although not approved, the new low-density zoning does not apply. City staff has resumed processing this application where it left off and is currently reviewing the environmental impact reports. The council voted at the meeting not to extend the 45-day development moratorium, which it had enacted at a special meeting on June 13. There was plenty of public comment, with most urging caution in next steps. Burks is encouraged that residents are involved and voicing opinions, saying that this continues to be an incredibly important matter for the property owner and the community at large. "Along with this public input, I'm confident that city staff and appropriate commissions will provide the council with comprehensive and accurate information to enable us to make our decisions," Burks said later. To help city leaders navigate the twists and turns of the saga of this 22-acre, privately owned land parcel, the council brought in the independent legal counsel of Coblentz, Patch, Duffy and Bass. Council Member Ivor Samson reported during the meeting that the San Francisco-based company is retained for a period not to exceed July 28. The saga is set to continue. As Mayor Don Tatzin has said on several prior occasions, whatever happens in the end will be determined in court.